BREAKING STORY IN PARIS: FEMALE SUICIDE/HOMICIDE BOMBER BLOWS SELF UP, ONE JIHADI SHOT DEAD…… – The Tundra Tabloids……. A female terrorist wearing a suicide vest has blown herself up and another jihadi is dead as more than 100 police and soldiers were today involved in a gunfight with up to six suspected Paris terrorists including the mastermind behind Friday’s massacres. 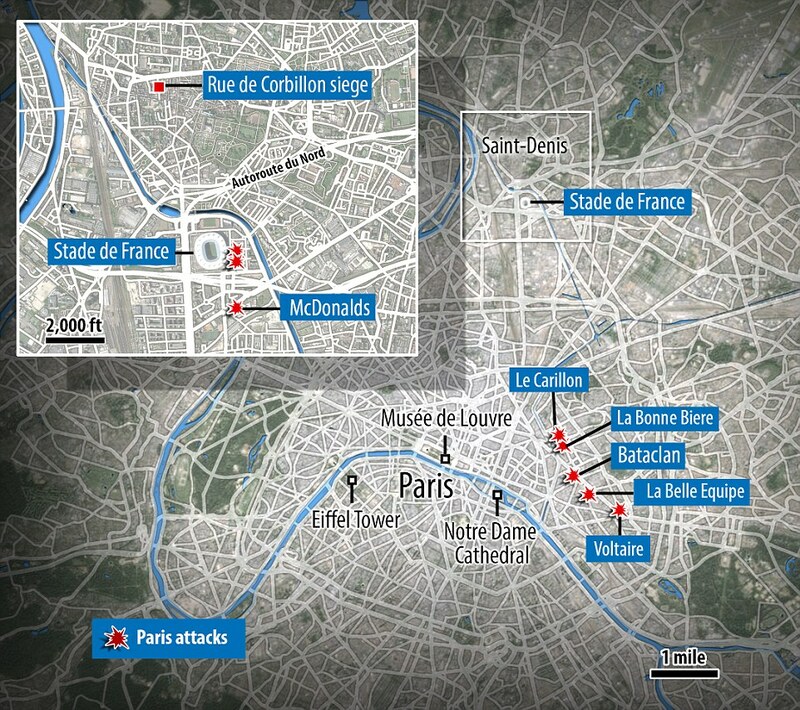 SWAT teams and special forces have surrounded an apartment in the Parisian suburb of Saint-Denis – close to the Stade de France – in a siege that started at 4.30am this morning. French media are reporting the architect of the plan that killed 129 people, Abdelhamid Abaaoud, 27, is alive and inside the flat – until now it was thought he was in Syria orchestrating the Paris attacks from ISIS capital Raqqa. A woman who may be Abaaoud’s jihadi bride is said to have fired her AK-47 at police before blowing herself up as an assault squad stormed the apartment block. Survivors of the Bataclan massacre where 89 people died insisted there was a female shooter. As she tried to kill police this morning a rooftop sniper shot dead another terror suspect through a window. Police have confirmed that three people in the apartment were taken alive and arrested while two others were held ‘nearby’ with security forces still trying to ‘neutralise’ more holed-up in the flat. An innocent person on the street may have been killed in the crossfire and at least five police have been injured in the ferocious gunfight. The terrorists also shot and killed a police dog. One of the nine suspected massacre shooters Salah Abdeslam, 26, who has been subject to an international manhunt focussed on Belgium, may also be inside. 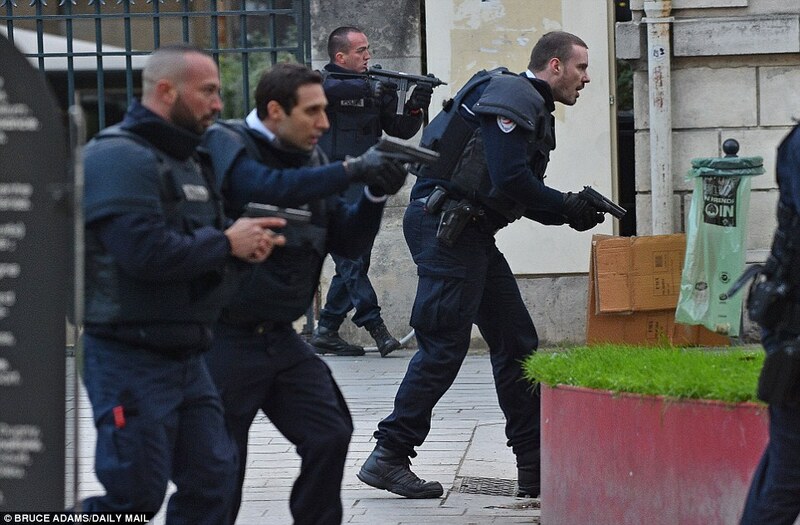 Teams of armed police appeared on a street outside the Saint-Denis flat before dawn today and then at least three trucks of soldiers and special forces arrived as back up. Witnesses told MailOnline there have been periods of intense machine gun fire and at least seven large explosions, caused by the suicide bomber and possibly hand grenades, as the siege continues. There are no hostages involved. Previous Post Previous Post LURCH’S STATEMENT IN FRANCE EPITOMIZES OBAMA’S FOREIGN POLICY APPROACH: ALL STUPID ALL OF THE TIME…….